The Roosters came away with a much-needed win against the Sea Eagles at Allianz on Sunday afternoon, although not a sufficiently convincing win to quash all the questions around their form and error count over the last couple of weeks. Two minutes in, Cooper Cronk made a statement of purpose with a terrific fifth-tackle kick, but with Boyd Cordner offside, and Latrell Mitchell called out for an offside penalty shortly after, Manly-Warringah were able to take control of the first part of the game. Two big runs from Addin Fonua-Blake and Jake Trbojevic were all it took to break a hole open in the Roosters’ ruck, allowing Fonua-Blake to slam past James Tedesco, Dylan Napa and Sio Siua Taukeihao on the third tackle for a try that initially seemed to signal the home crowd’s worst fears about their team’s form over the last couple of weeks. In a weird twist, however, Daly Cherry-Evans missed the conversion right in front of the posts, deflecting the Steeden away to the left for the second worst kick of the year so far after Kieran Foran’s under-the-crossbar-effort. Things got worse for DCE at the end of the next set, where some big runs from the Manly forwards came to nothing after Cherry-Evans was forced to put the ball on the boot on the final tackle, allowing Tedesco to catch the footy on the full with no effort. A high shot from Joel Thompson piggy-backed the Chooks back up the other end of the field, where a superb cut-out pass from Luke Keary almost put Latrell Mitchell over on the left edge, only for a desperate mass of Manly jerseys to hold him up just on the line. It was just the show of strength from Sydney City that the Sea Eagles needed to reather and regroup, and by the time that Cronk had set up his crossfield kick back to the right edge, Brian Kelly had got in place to beat Mitch Aubusson under the ball, for the best single take of the afternoon so far. Four tackles later, Akuila Uate crashed over out of dummy half, after a silky string of passes from DCE, Tom Trjbojevic got him in place. Putting his head down, the big winger darted between Cronk and Aubusson, taking Blake Ferguson by surprise as well, for his second try in three games as a left winger, as well as his first try against the Roosters since 2011. This time DCE added the extras – from a much more difficult kicking position – but this was the end of Manly’s early surge of momentum, as some quick thinking and bright leadership from Tedesco saw Fergo crash over for a spectacular corner try a couple of sets later. It started with Teddy opting for the short side, drawing in Kelly and DCE on the right edge before popping the footy across to Aubusson, who flicked it across to Ferguson in turn. From there, Fergo did what he does best, tumbling over Thompson for a one-handed, mid-air putdown that looked ever freakier in slow motion. The conversion was just as spectacular, with Mitchell slotting through a Cleary-esque strike that nearly cleared the top of the goal posts before sailing through to put the Roosters a try behind at 6-10. For a moment, a linebreak from Tom Turbo looked like it might signal a Manly resurgence, but the visiting fullback followed it up immediately with an error, while a further error from Matthew Wright and then a penalty on Jake Trbojevic for not being square at marker gave the Roosters a chance to level the scores. They did so quicker than might have been expected, however, as Isaac Liu collected the footy from Jake Friend eight metres out from the line for what should have been a hit-up or a passing opportunity, only to stroll through three of the Sea Eagles’ most determined players in Taupau, Koroisau and Taniela Paseka and put down four more points. The try looked even more unlikely in slow motion, not least because Liu actually fumbled the Steeden in the midst of the tackle, but somehow chose the one moment at which his arm was away from the Manly defence to allow himself this brief moment of vulnerability. The tackle looked stranger with each replay too, as Paseka, Koroisau and then Taupau joined the fracas, each assuming that the previous defender would be enough to prevent an attack so slow and deliberate from Liu that he was almost walking for the first couple of seconds. For the first time in the game, then, the Roosters were in front, once Mitchell had added the extras. 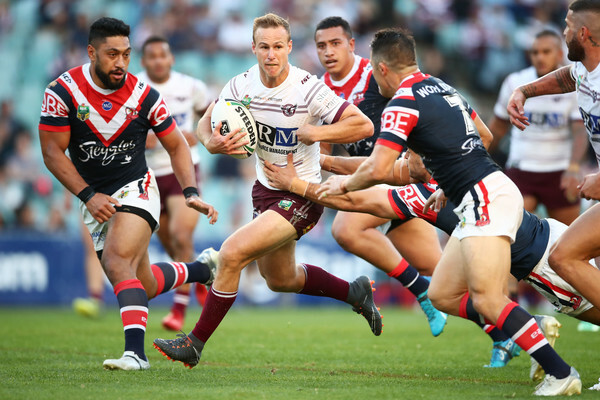 Still, DCE responded in kind, starting the next set with a monstrous kick that utterly defied Teddy, and gave the Sea Eagles a dropout instead of allowing the Roosters a fresh shot at the line. If Manly had won the game, this would definitely have been seen as one of the key turning points, especially because a flop from Napa gave DCE the opportunity to level the score with a penalty kick a few tackles later. Nine minutes out from the siren, and several interchanges later – Jared Waerea-Hargreaves for Napa, Zane Tetevano for Taukeiaho, Victor Radley for Liu Lloyd Perrett for Taupau – a slow peel from Perrett gave Mitchell the opportunity to regain that two-point lead with a penalty kick of his own, while an offside penalty from JWH saw DCE clock up a second penalty kick to level the scores once again at 14-14. A great take from Teddy under a DCE bomb, combined with an offside penalty from Jake Trbojevic, initially looked as if it might give the Roosters another chance before the break, but they ended up locked at 14-14. They didn’t waste their time in the second stanza, though, after Tom Trbojevic fumbled the high ball under some pressure for Tedesco, to start what would be one of the more forgettable forty minutes for the Manly fullback in 2018. Conversely, this would be a pivotal half of football for Victor Radley, who regathered the footy and got the Chooks in position to send it out to the left edge on the first tackle. The Sea Eagles pre-empted them, however, forcing them to bring the Steeden back to the middle, and with Cronk and Tedesco sending it across to the right it looked as if we might be in for some side-to-side play, only for JWH to score off a similar barnstorming effort to Liu’s spectacular try in the first half. It started a well-timed pass from Zane Tetevano, who sensed his prop storming up from the back of the pack, and got the ball across just in time for JWH to dodge around Dylan Walker, slip out of a tackle from Shaun Lane, and then slam through Apisai Koroisau for a near mirror image of Liu’s earlier four-pointer. Another quick try would have completely consolidated the Roosters’ ownership of the back forty, but some good kick pressure from Thompson ensured that Cronk’s next effort with the boot went out on the full, despite Fergo’s best efforts to pop it back into the field of play. Yet for all that it seemed to herald the start of forty minutes of dominance, this would turn out to be the last try of the night for Sydney City. It says a lot, then, that the Sea Eagles reached some of the worst moments of their season so far over the next half hour, with a series of dropped balls from Tom Turbo and Frank Winterstein setting the platform for a pair of amazing tackles from Radley – the first on Taupau, the second on Walker to prevent what initially appeared to be a certain try. Manly’s woes continued with one of the most frustrating – if justifiable – calls of the night, as a very premature tackle from Mitchell on Tom Turbo was actually followed by a penalty for the Roosters, due to Moses Suli running Joseph Manu off the footy in the backplay. To add insult to injury, an offside penalty for Jake Trbojevic saw Mitchell clock up two more points a couple of minutes later, extending the winning margin beyond a converted try for the first time in the game. A huge tackle from Taupau on Tedesco on the next set signaled the Sea Eagles’ frustration, but the Roosters remained unphased, with Radley helping to force an error in the play the ball from Matty Wright shortly after. Still, Ferguson was the wild card, as he so often is in clutch situations, coughing up the footy on the Manly line, and giving the Sea Eagles another shot to get back in the game. In fact, Uate slipped through a tackle from Fergo and crashed over, but not without a forward pass from Tom Turbo leading to a call of no try. Things went from bad to worse for the Manly fullback on the next set, when he lost the ball following a well-timed Cronk kick, but Fergo was also starting to slip too, crossing over himself shortly after only for the Chooks to have a try of their own called back, this time due to a forward pass from Keary. It felt apt, then, that the game ended with a one-on-one between Uate and Ferguson, after Kelly lobbed the ball over to his left winger just as he was slamming to ground beneath Aubusson. The result was a classic Uate try, and a great contest with his Roosters opponent, as he bent down and burrowed his head into Fergo’s chest, bouncing off the big winger before landing on his back and reaching out a hand to slam the Steeden to ground. With DCE slotting through a perfect sideline conversion, the Sea Eagles were only two points behind, yet that just made their final defeat all the more frustrating, bringing them to two and seven for the first time since 1999. It was a strange second half of football, then, bookended by a pair of tries, but with both teams struggling to make an emphatic gesture in the interim. Both the Roosters and Sea Eagles will be looking for a more definite statement when they take on Warriors and Broncos, although Manly will be particularly hungry for a win after suffering their worst start to a season this century.